Three Middlesex University TV Production students have won $8,000 in prize money, after their documentary film took first prize at the Nasser Bin Hamad International Youth Creativity Awards 2014 in Bahrain. A team of three BA Television Production graduates from Middlesex University have won $8,000 in prize money, after their documentary Music Is Vision won first place in the 18-24 Years category at the prestigious Nasser Bin Hamad International Youth Creativity Awards 2014 (NBH Awards) in Bahrain. 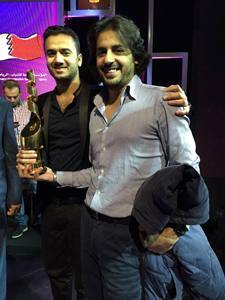 Omran Baluch (23), Abdulaziz Alfuraih (31) and Marius Ulevicius (23) were presented with their award by Prince Nasser bin Hamad Al Khalifa at the ceremony on 1 December 2014, and say they plan to use the winnings to fund their next film project. Filmed over a period of three weeks in Vangani, a town in Maharashtra, India, the touching documentary follows the lives of a blind couple and their two young children. "A couple of months before we travelled to India, while we were researching the project, we made contact with a community reporter in Vangani," explains Omran, who graduated in July 2014 with a first class degree. "We explained our project to him over the phone and he agreed to help us find blind characters to film. 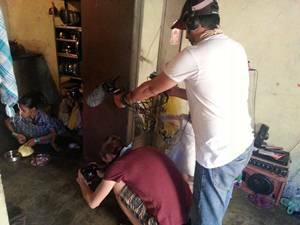 "When we arrived in India we spent a week meeting around 20 blind families, and then we spent another week with one family – getting to know their daily routine and the hardships they go through, interviewing and filming them in different locations." The trio made the film as their final degree project using equipment they borrowed from the University's Loan Store and were mentored throughout by Senior Lecturer Tom McGorrian. Though they were confident the film would receive a good reception, they only found out they had won at the awards ceremony. "We didn't know who the winner was until our names were announced on stage at the University of Bahrain and we received the award from His Highness Prince Nasser Bin Hamad," says Omran. "It was a very proud moment." The team now plan to set up their own company called AMO Productions and are already planning their next film. "The prize money will go towards our next independent short documentary project, which is currently in the early stages of development," adds Omran. "Our ambition is to continue making documentary films which bring out the unheard stories and document the reality of different corners of the world." Following the film's success at the NBH Awards, Omran and his colleagues are hoping they can follow in the footsteps of former Middlesex student Alicia Rovira-Parker by winning a Student Television Award at the Royal Television Society's annual awards in 2015. Music Is Vision has been entered into a number of film festivals so is not yet available for public viewing. Watch this space for its release.